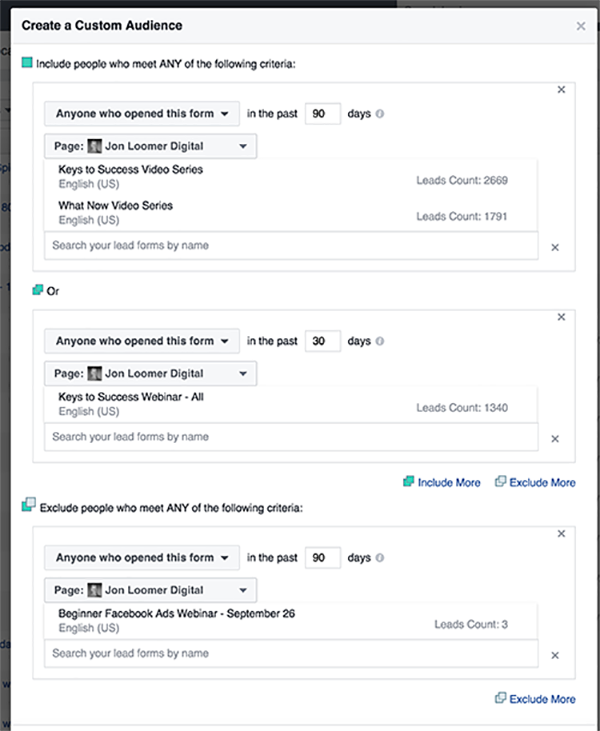 Several updates are rolling out that improve custom audience creation related to Facebook ad targeting. Most of these updates are related to Instagram. If you’re a business on Instagram, you are bound to benefit! You’ll notice “Updated” for Video and Lead Form. 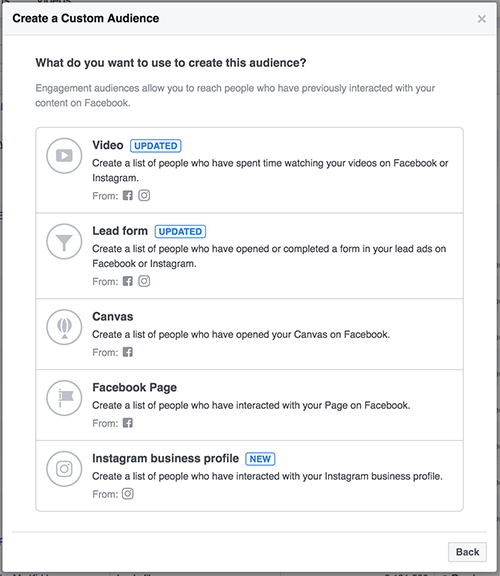 The primary update for both audiences is that they now include engagement with your videos and lead ad forms when shown on Instagram. 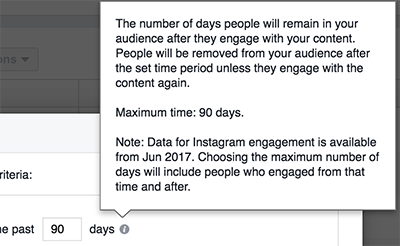 When creating these audiences, Instagram engagement is available beginning in June of 2017. It’s not clear if this also applies to video, but I will assume it does. 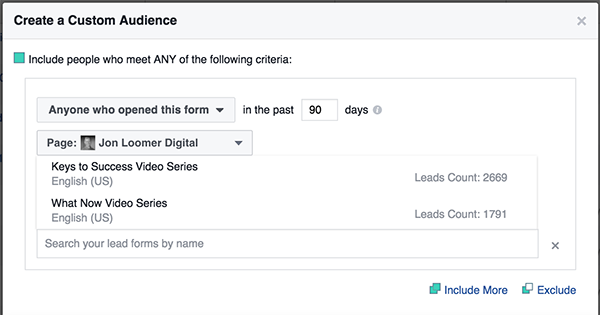 There are a couple of other updates to lead form engagement custom audiences, but they aren’t related to Instagram. Previously, a single audience could only include engagement with one lead form. Now you can include multiple. The audience can be as simple as engagement with a single or multiple forms. You can make it more complicated by adding “OR” logic to include a different type of engagement with another form. Or you could make sure to exclude engagement with yet another form. If you go back to the first image at the top when creating an engagement custom audience, you’ll notice the addition of Instagram Business Profile. That’s potentially huge for brands who are heavily involved on Instagram. Note that durations of 1 to 365 days can be used here. However, once again, the data only goes back to June of 2017. 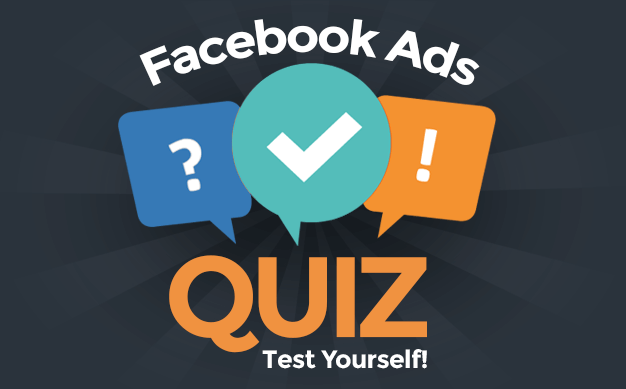 As a result, this audience may be quite small unless you get significant activity on your business profile — at least for the time being. If you have problems with this, it’s likely that your Instagram profile does not appear. If that’s the case, it may be because your Instagram profile wasn’t converted to a business profile. That’s the problem I had. While I have an Instagram profile and I run Facebook ads to Instagram as a placement, a profile didn’t initially appear for me. That’s because the Instagram account that I use wasn’t technically a business profile. When viewing your Instagram account, click on the gear icon. 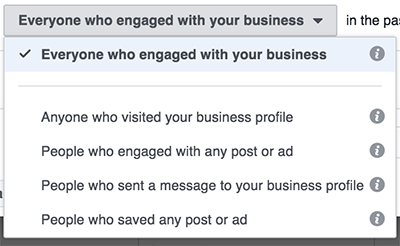 You should then see an option to convert to a business profile. You’ll be instructed to log into Facebook and then select the Facebook page you’ll want to connect to this account. Ultimately, that’s how an Instagram business profile appears when creating custom audiences. While I do run ads to the Instagram placement, I’ll admit that I’ve been slow to getting heavily involved with Instagram otherwise. That may be a mistake. And this addition may be the motivation I need to get into it more. Do you have a business profile on Instagram? Have you started creating these audiences yet? I’d love to hear how you’re using them!